Location: Boissy-Saint-Léger, in the Val-de-Marne departement of France (Ile-de-France Region). 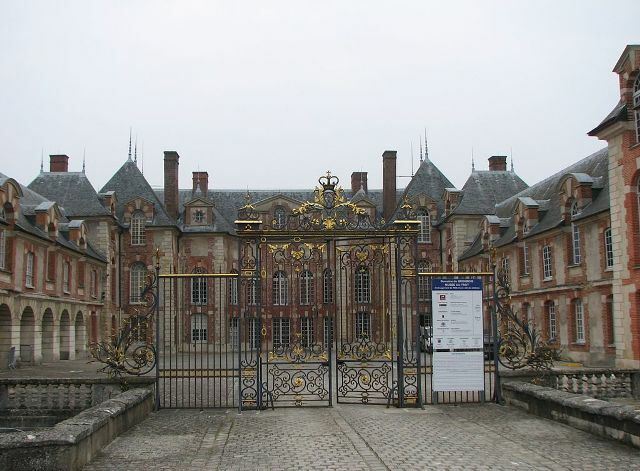 Notes: Château de Grosbois is located in the Val-de-Marne in the municipality of Boissy-Saint-Léger. The castle has multiple protections under historiques3 monuments: an inscription in 1933 for the castle, a ranking in 1948 to the facade and roof of the castle, common, entrance gate, pavilions and the park, a registration 1964 facades and common roof. Built by an architect whose name is unknown, the castle of Grosbois is clearly influenced by the creations of Jacques Androuet Hoop. U-plane, it contains in its center a main body curved exedra flanked by flags of the same height and flanked by two lower wings at right angles. The castle is built on a rectangular platform ditched once water; is accessed by three bridges.